With half of our externship now past, some exciting things are happening in the lab! 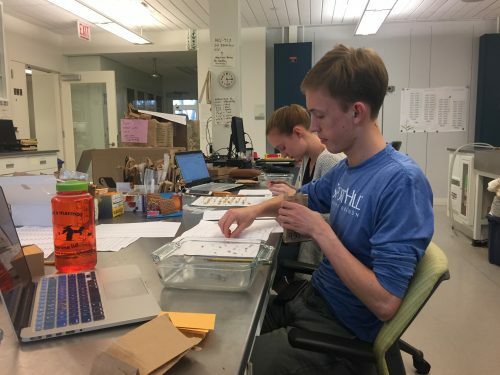 Yesterday, Sarah, Tris, and I had the opportunity to talk with Stuart, Michael, and Lea about some of the research questions and hypotheses we’ve started to form while working so closely with the specimens over the past week and a half. Stuart offered several suggestions about how to formulate these questions so that they are testable with the kinds of data we have, while also advising us about the statistical approaches we could take to assess our hypotheses. As we gather together the last crucial pieces of data, we’ll have the opportunity to try answering some of these questions. If all goes well, we will be rounding out our experience working with Team Echinacea by the end of next week with our own independent projects and analyses of the data. In the meantime, we have been continuing our final steps of data collection. Despite our earlier trials and tribulations holding our breath while individually counting hundreds of seeds the size of sand grains, our new Solidago counting procedure seems to be a success! With a more efficient system in place, we hope to finish counting seeds by the start of next week. All that remains after that is x-raying and classifying the x-rays from all of our samples of Echinacea, Liatris, and Solidago before we can gather together all of our data into frames. As we learn more and more from our mentors about how to manipulate data sets in RStudio, I can’t wait to start assessing regressions and comparing models soon!